Auteurs : IGLESIAS A., MONEO M., LOPEZ-FRANCOS A.
Ajouter au panier le livre de IGLESIAS A., MONEO M., LOPEZ-FRANCOS A. Natural rainfall variability is a recurrent characteristic of Mediterranean climate and intensive drought events have been more frequent in the last four decades with significant damages derived from water scarcity and low water quality at the local and national levels. 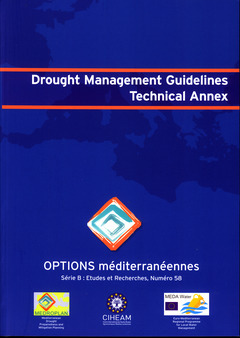 In this context, Mediterranean countries have adapted to their climate and have extensive legislation, institutional capabilities, and technical resources to face drought. Nevertheless in most cases a proactive drought management based on anticipatory planning is not implemented. There is a need to formulate plans for drought management that shift from a reactive approach (crisis approach) to a proactive approach based on risk analysis, adapted to the current natural and social resources and taking into account the dynamics of the social and environmental pressures.